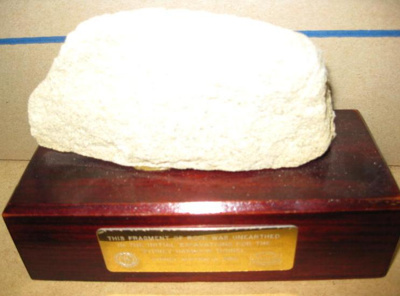 Rock fragment, mounted on wooden plinth, with brass plaque affixed, engraved 'This fragment of rock was unearthed in the initial excavations for the Sydney Harbour Tunnel. Sydney Australia 1988', with the Rotary Club and Sydney Harbour Tunnel logo. The Sydney Harbour Bridge Act was passed in 1922 and Public Works commenced work on the northern approaches in 1923. Dorman Long and Co won the contract to build the Bridge. They based their steel fabrication at Milsons Point where the cliff face was blasted to fit the huge workshops. Up to 500 homes and businesses in Milsons Point, Kirribilli and North Sydney were demolished to build the Bridge’s approaches and pylons, and the rail line from the new North Sydney station to Waverton. The resumptions began during a state-wide housing shortage and ended on the eve of the Great Depression. The opening of the Bridge on the 19th March 1932 was a huge affair involving official and locally organised events. Despite the trauma of the resumptions and the hardship of the Depression, North Sydney residents and businesses organised a week of celebrations. The Bridge was celebrated as a national icon; more souvenirs were produced to mark the opening of the Sydney Harbour Bridge in 1932 than for any previous event in Australia’s history. The Bridge changed North Sydney from a vital transport hub into a corridor through which people passed on their way to and from the city. Upon opening in 1932, its six-lane road was named the Bradfield Highway. The Warringah Expressway was begun in 1960 and local residents were again faced with demolition and upheaval. North Sydney was cut in two upon its completion in 1968. The Sydney Harbour Tunnel was opened in 1992 and the Bridge’s northern pylons came to house its vehicle emission vents.